Obverse – The tower “Guiata” built in the 10th century is surrounded with the inscription “SAN MARINO” and the twelve stars of Europe. Lettering: 2006 SAN MARINO Ch R ELF INC. Reverse – Globe in the bottom left. The (initial design:2002) then-fifteen members of the EU are lightly highlighted . 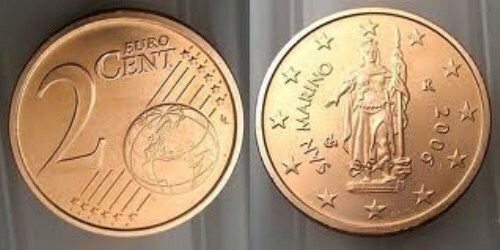 Six fine lines cut diagonally behind the globe from each side of the coin and have twelve stars at their ends (reflective of the flags of Europe). 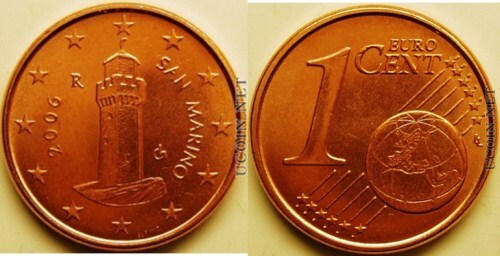 To the top left is a large number 5 followed, in smaller text, by the words “Euro Cent”. The designers initials, LL, appear to the right of the globe.